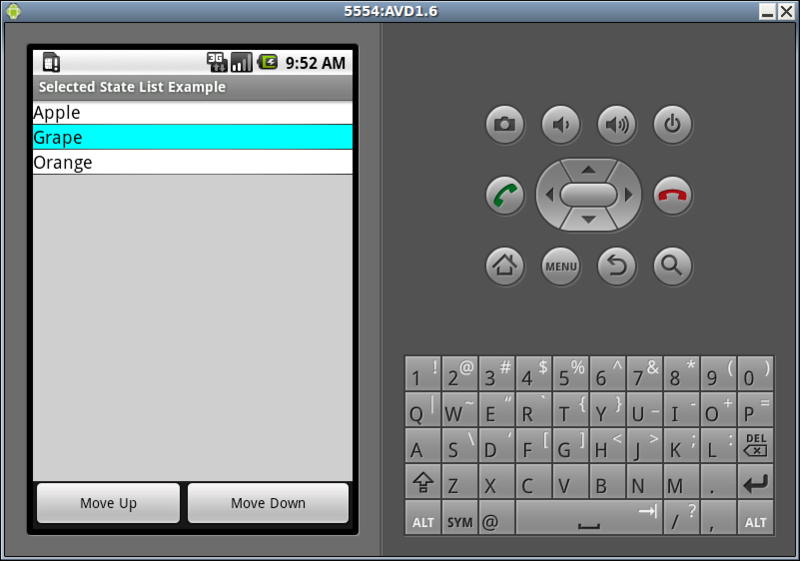 This is a basic dialog example that includes a scrolling widget container with an “Ok” and “Cancel” button on the bottom of the screen. 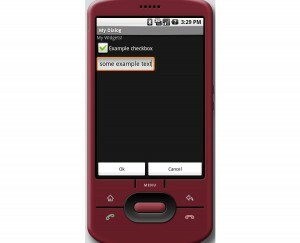 This is a general use dialog with a lower case “d” not to be confused with the Android Dialog class. A scrolling area is far from a sophisticated layout design but it is a simple solution for supporting various display sizes. 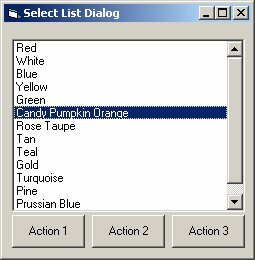 This basic dialog can be used to show user messages, editing of application settings and more. A vertical scrolling layout also future-proofs your applications for distribution on new Android devices with different screen dimensions than what we’re building for today. While porting some older Java code to the Android platform, I read that it was possible to place custom files in the “files” directory reserved for the application. Great, that’s exactly what I need since packaging data files with the application as resources did not make sense in this case. So how do you move your own files into this directory? With the Android emulator running, in Eclipse open the DDMS perspective, then select the File Explorer tab. Expand the directory tree to: data/data/com.your.package. Ok so where’s the “files” directory? Good question. Other posts I read on this subject seemed to assume that it will just be there. However on my emulator the files directory is not there by default. So how are we supposed to create the files directory? Here’s one way. In your code write a test file to the default location, meaning don’t prepend with a path. Doing this will create the files directory and will also write the test file there as well. One caveat, if you delete all of your emulator temp files, the files directory and it’s contents will also be destroyed. After executing the above code on your emulator, you should now see a directory named “files” at data/data/com.your.package/files. This code needs to import java.io.FileOutputStream and also uses a reference to the Context. Move files into your new files directory by clicking the Push Files icon in the upper right corner of the DDMS-File Explorer view. If you know of an easier way to create the files directory please let me know. This example demonstrates basic drawing concepts using the Google Android SDK. The best way to understand a drawing api is to actually use it. 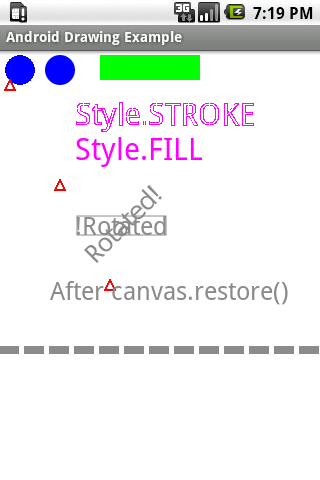 This example extends Activity, creates a subclass of View and overrides the View.onDraw(). All of the drawing code in this example is located in the onDraw() method.